The West Virginia rental agreements are residential and commercial real estate contracts designated for the intended use between a landlord and tenant. The landlord will usually require the tenant to undergo a quick examination of their employment and background through an application. Once completed, the landlord will review and decide whether or not they are fit for tenancy. All written forms must be in accordance with State Codes Chapter 37 (Real Property). Rental Application – Used to verify the legitimacy of a tenant’s finances, employment, and references when applying or housing. Commercial Lease Agreement – For a business use such as professional office, retail (store, restaurant, etc. ), or industrial space. Not for livable use. Lease with Option to Purchase Agreement – Sometimes referred to as a “lease to own” as the rental contract can change into a purchase and sale if necessary at the sole option of the tenant. Month to Month Lease Agreement – Known also as a ‘tenancy at will’ and can be changed or cancelled at anytime with proper notice from either landlord or tenant. In accordance with § 37-6-5 it must be within at least one (1) month. Roommate Agreement – Between the members of shared home where each person usually receives a bedroom and the form designates the rules for: the common areas, guests, utilities/expenses, noise, and any other agreed upon terms. Standard Residential Lease Agreement – A fixed term arrangement with a start and end date. The most common type of residential contract as it usually goes for a term of one (1) year. Sublease Agreement – For the use of a tenant that would like to rent their space under contract with a landlord to another person. Also known as a ‘sublet’ and the landlord will usually be required to consent to such type of tenancy. 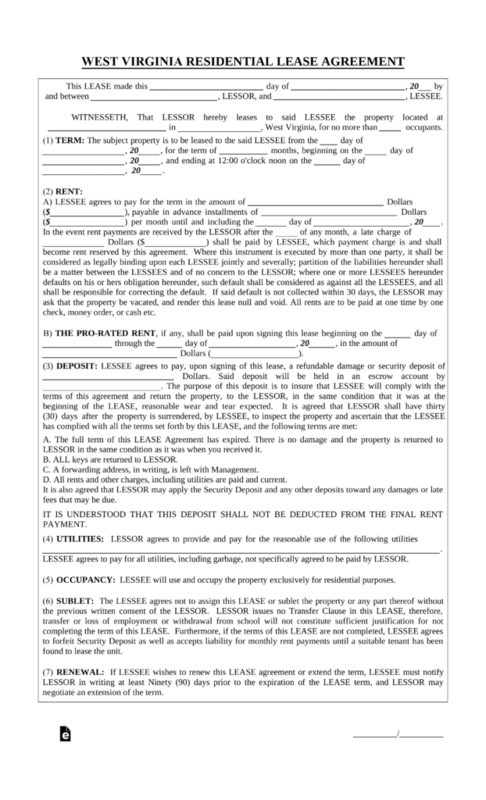 Termination Lease Letter (30-Day Notice) (§ 37-6-5) – Official form used to give either the landlord or tenant notice to cancel a month to month lease. In West Virginia the State requirement is to give at least one (1) month’s notice. Lead-Based Paint – If any housing development was built prior to 1978, then under federal law, the tenant must be informed through the disclosure form by all inhabitants placing their signature. Non-Refundable Fees (§ 37-6A-1(14)) – Any and all non-refundable fees must be stated in the rental contract. There is no statute that requires the landlord to give notice to the lessee before entering their property. Maximum – There is no law stating that a cap is designated for how much a landlord may ask at the beginning of tenancy. 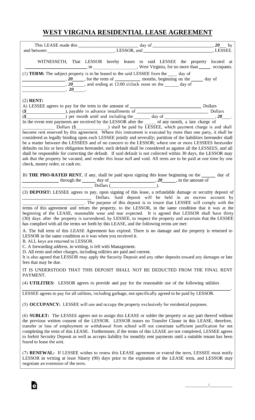 Returning (§ 37-6A-1) – The landlord must return the funds within sixty (60) days. Although if the landlord re-rents the premises within forty-five (45) days of the termination of tenancy the deposit must be returned.